** This post is dedicated to my dear friend and sister in storycraft, Kim Koning. In the little corner of the online writing and reading community that I occupy, I often come across photos, memes, slogans and posts extolling the virtues of the printed book over the eBook. I usually avoid the discussion because my appreciation for eBooks comes from living in countries where English is not the national language and no-one wants to hear me rave about my travels. 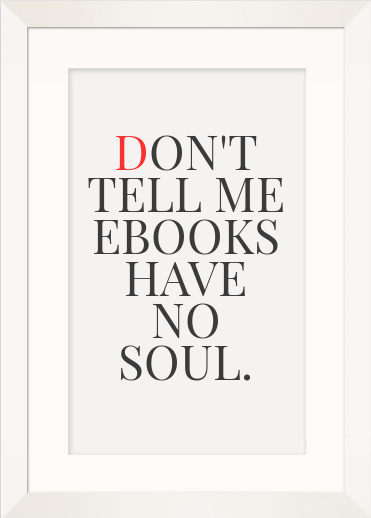 However, something happened to me yesterday which made me think about the element of the print vs eBook argument which gets under my skin: the suggestion that eBooks "have no soul." Now, if the claim of no soul is in terms of decorating a house, I can understand that - my favourite wall decoration is a tall bookshelf filled with the higgledy piggledy colours of print books - but the anti-eBook people (including members of most of the mainstream book review sites and shows I tune into) are claiming that reading an eBook is a lesser experience than reading a print book, and I call shenanigans. A couple of weeks ago, I was struck down by something from which I am still recovering. I have been napping a lot, and unable to focus enough to hold my whole novel in my head in the way that I need to when in editing mode - playing Farmville and Candy Crush has been about my intellectual capacity, and I've been avoiding email. Yesterday, I woke from a nap and felt the pang of guilt of having not checked my email properly for a week, so I burrowed in, pulled my tablet pc under the covers, and braved the inbox. I soon began to regret bringing the outside world into my little haven of warmth and healing, when an email popped up from Amazon with the subject "a gift for you from Kim Koning." The email had a short message from Kim and a link to a kindle version of The Night Circus, by Erin Morgenstern. Those of you who join #storycraft chat each month will know Kim as my co-host of the writing tweet chat that I started in 2010 - we met when she joined as a participant on the very first chat - and she has become one of my dearest friends. Kim lives in Auckland, so our friendship takes place via approx. weekly Skype chats, and texts and conversations via Facebook in between, so she knew I'd been ill and had noticed that I had "gone dark" as she calls it when one needs to shut out the online world for a while. The last time we had Skyped, we had discussed The Night Circus as one of her favourite books, and I'd told Kim I hadn't read it, but that I would put it at the top of my to read list.